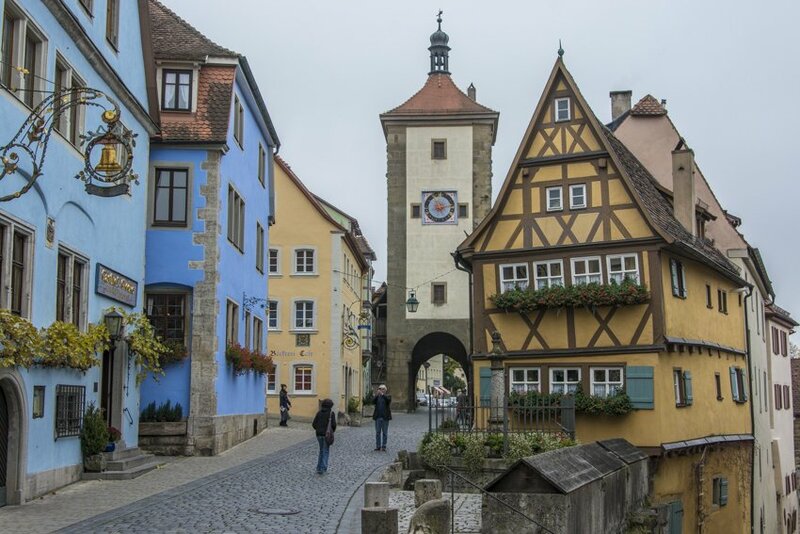 Rothenburg ob der Tauber, meaning above the Tauber river, has long been on my bucket list, ever since I bought my Germany Lonely Planet not long after I found out I was moving here. 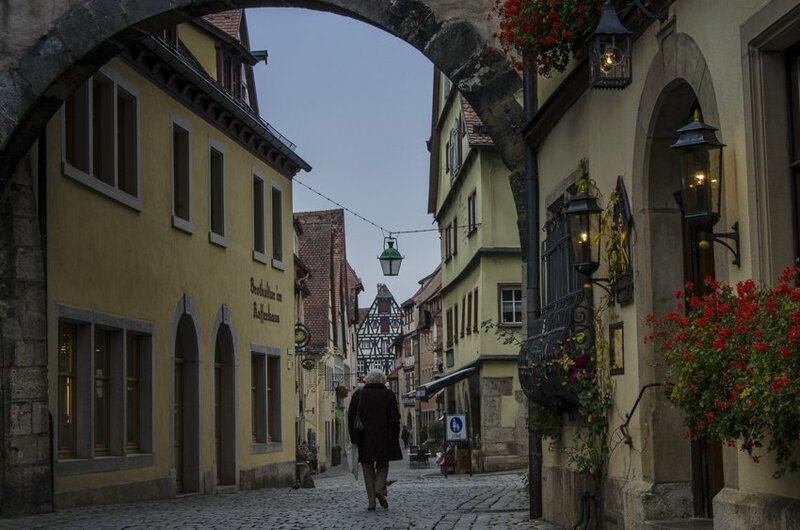 Since living in Germany I have met a few people who have visited Rothenburg ob der Tauber and said that it is a pretty town but over-crowded with tourists. 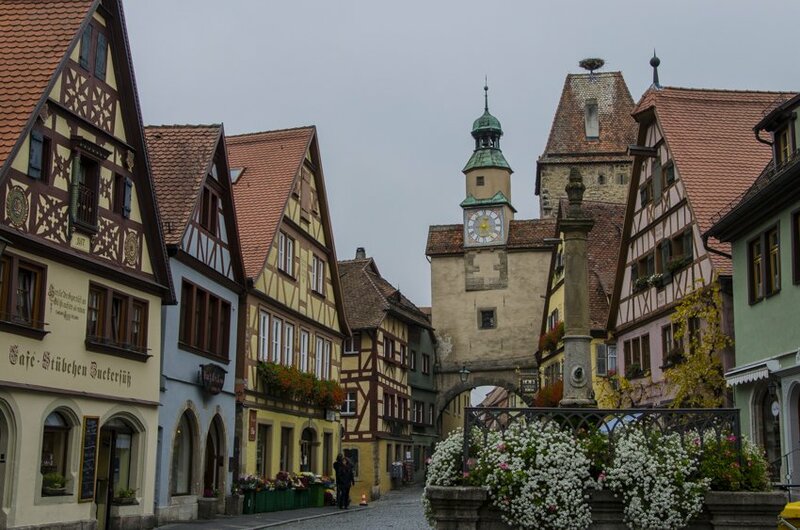 Despite this we decided to see it for ourselves and make up our own minds about Rothenburg on our recent road trip around southern Germany. I am happy to say we loved Rothenburg ob der Tauber! Admittedly we only focussed on the old part of the city but it is one very cute old town that has an incredibly romantic feel about it. It is all about the atmosphere created in the town, you can spend hours wandering the cobble-stoned streets, within the city walls, amongst the colourful half-wooden medieval houses. There were a couple of tour groups in the main square and an American couple asking to take a photo of a film crew, otherwise we felt that like it was just us and the locals. However we can imagine it getting pretty hectic during summer so we would highly recommend visiting off-season like we did, in autumn. There are decorated fountains in every charming square and there are forty-two gates and towers that are part of the fortification that surrounds the town. You can walk along parts of the old wall and gain a different perspective of the town and its colourful buildings that follow very strict preservation laws. We started at Jakobskirche, mainly because it was a short walk from our hotel. 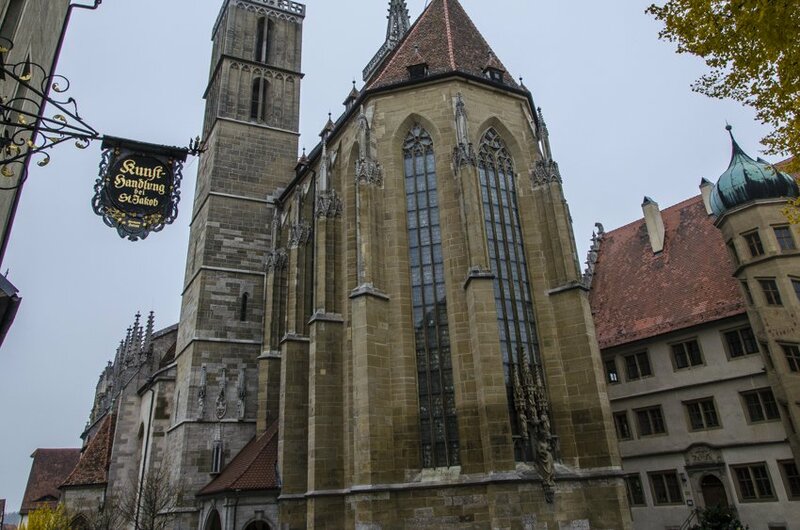 A majestic Gothic church where it is claimed a drop of Christ’s blood is kept in the Heilig Blut Altar (Holy Blood Altar) though this is debatable according to the manager at our hotel. From there we made our way to Marktplatz, the main square and then began our aimless wandering and stopping every five seconds to take photos of the pretty buildings. 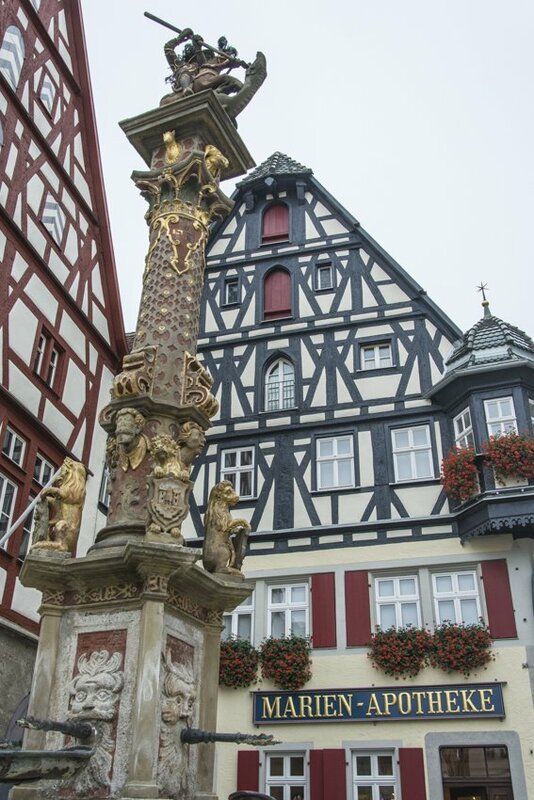 Nearby you will find the tourist office building which has clock figures on the facade that re-enact the story of the Meistertrunk (master drinker). It is a tale that stems from the thirty year war (Catholics versus Protestants) and Rothenburg was invaded by a Catholic general called Tilly. Tilly captured the mayor and other important towns people. Legend then says that the town’s people gave Tilly a huge cup of wine and he then challenged one of them to step forward and skull the cup of wine in one go in order to release the captured. The mayor stepped up to the plate and the town was freed! It is suspected that the truth is that Tilly was enticed by some hard cash. However, this has not stopped the Rothenburgers celebrating the Meistertrunk which was even turned into a play that is performed each year on Whitsunday. We were quite happy to just wander the laneways and enjoy feeling like we were in a fairy tale, this meant we didn’t visit many of the tourist attractions. I must confess, we did go to Käthe’s Wohlfahrt Weihnachtsdorf, the most extensive Christmas shop you have ever seen! Ok, I’ll admit it, we bought some Christmas decorations there and in the Heidelberg branch of the shop. We are suckers for all things Christmas. The town actually also has a Christmas museum (Deutsches Weihnachtsmuseum) but we didn’t visit it. As I have already mentioned we were addicted to photographing the delightful multi-coloured medieval houses. The city gate and house below are apparently two of the most photographed icons of Rothenburg ob der Tauber. 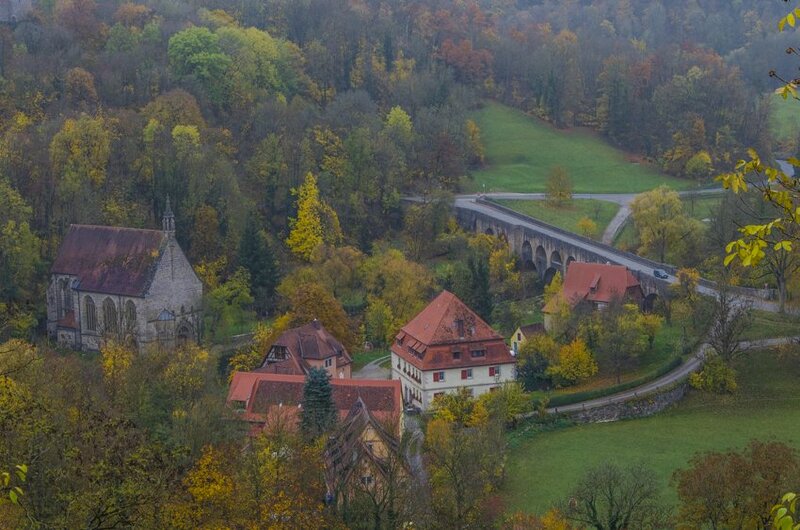 We would highly recommend that you wander to the west side of town for gorgeous views of the Tauber river and valley and the Doppelbrücke (double bridge). The autumn colours mixed with the cute little buildings speckled amongst the forest make for some stunning scenery. Lets have a brief discussion about the famous food speciality of Rothenburg ob der Tauber. 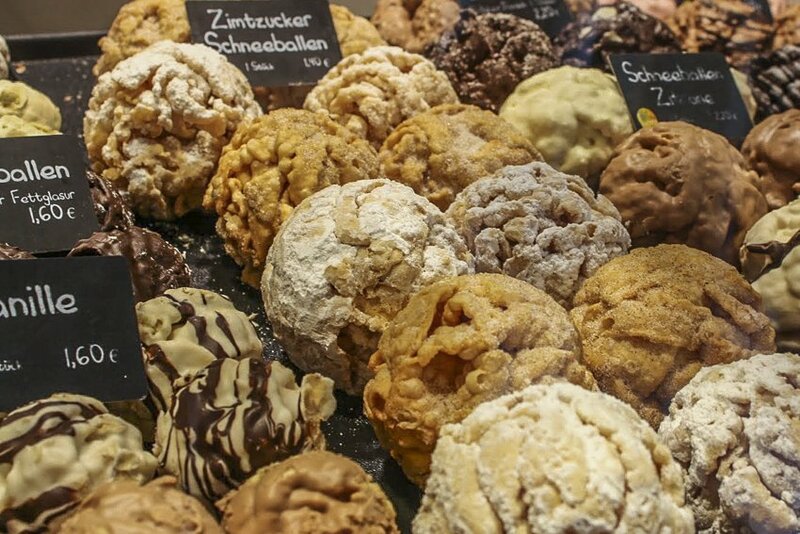 Schneebällchen (snowballs) are essentially large balls of shortbread-like biscuit covered in chocolate, sugar or cinnamon. You can buy different flavours like Baileys, coconut and marzipan. Sounds amazing right? They look absolutely scrumptious! Now I have to admit we had a sneak preview of these in Heidelberg. Unfortunately they were rather disappointing. The extra flavour, I bought a chocolate covered in Baileys one, was barely detectable and it was like all of the left over cookie dough had been rolled into a ball and baked, a little dry and too much biscuit for me. However, I am happy to report David found a better version, in our opinion, while we were in Rothenburg. 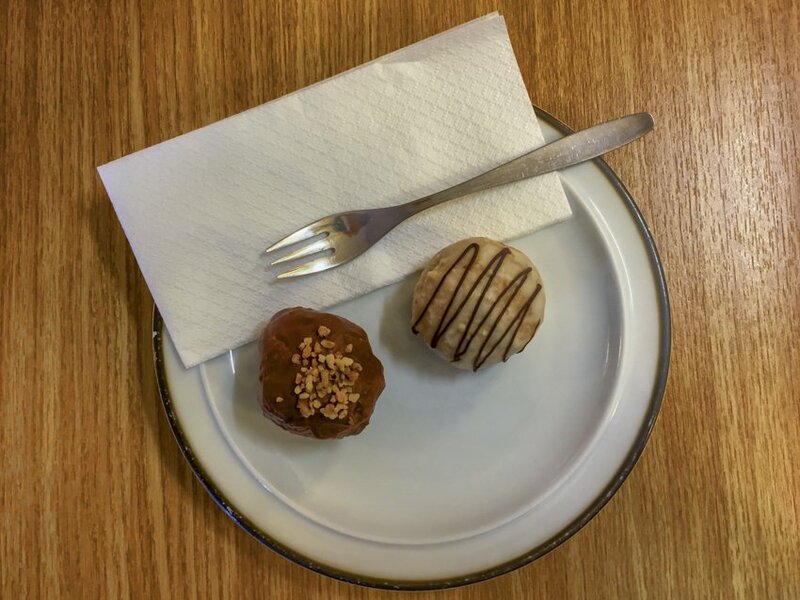 These were smaller mini versions of the traditional schneebällchen and were tastier, delectable balls of soft cookie dough covered in chocolate. Our sweet tooth was well and truly satisfied. YUM! 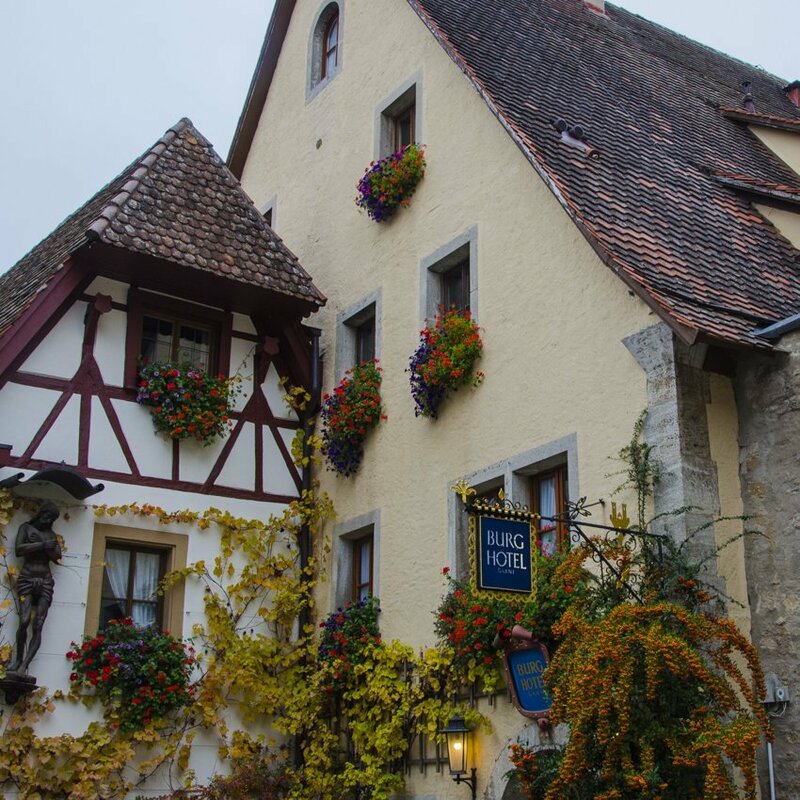 During our road trip we had been staying in budget hotels and had decided to have one splurge on accommodation in Rothenburg ob der Tauber. We stayed at Burg Hotel in the old part of the city. What originally appealed to us was that it is over eight hundred years old and is built into the old city wall. It is a hotel filled with charm and the service is excellent. The subtle beige and cream tones combined with gold accents and dark wooden furniture gave the room a sense of opulence without being over the top. We were lucky to have a room overlooking the autumnal colours of the valley. If you are not lucky enough to have a room with a view, don’t fret, the breakfast room and terrace will also satisfy your visual senses. The hotel is right next to the Kloster (monastery) gardens which provide a little piece of tranquility away from the tourists. 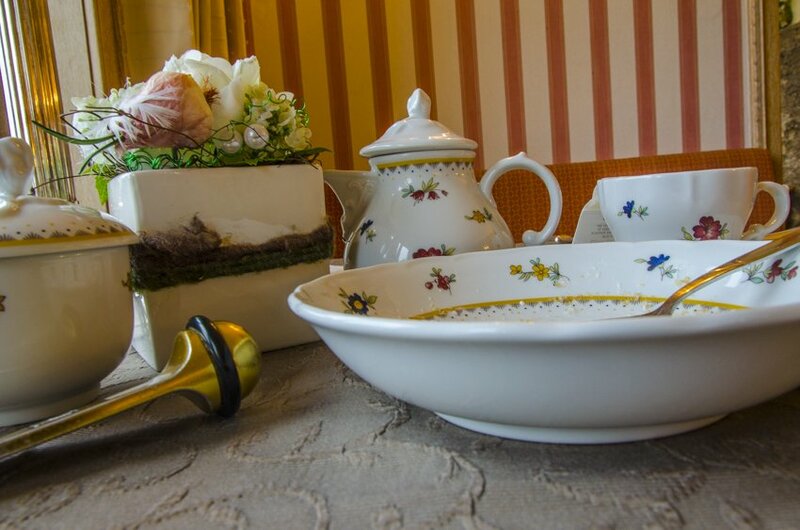 The old-world charm is throughout the hotel, from the beautiful matching china at breakfast to the common lounge room that contains antique furniture, a baby grand piano and a sitting area. Also adding to the hotel’s charisma was the hotel’s manager who enthusiastically told us about the hotel’s history and how it had been some sort of hotel or refuge for travellers for a large part of the building’s existence. We would highly recommend that you treat yourself to a night of splendour at the Burg Hotel. We would like to add that we did not receive any compensation for this recommendation or for staying at Burg Hotel. Just enjoy! According to the super friendly guy at our hotel Rothenburg ob der Tauber is pretty quiet during winter which surprised us. We were imagining it to be incredibly romantic with the snow covered rooftops and a cute little Weihnachtsmarkt (Christmas market) that every decent German town has during the festive season. We are definitely considering going back during the Christmas market season for a day trip or even a weekend trip. 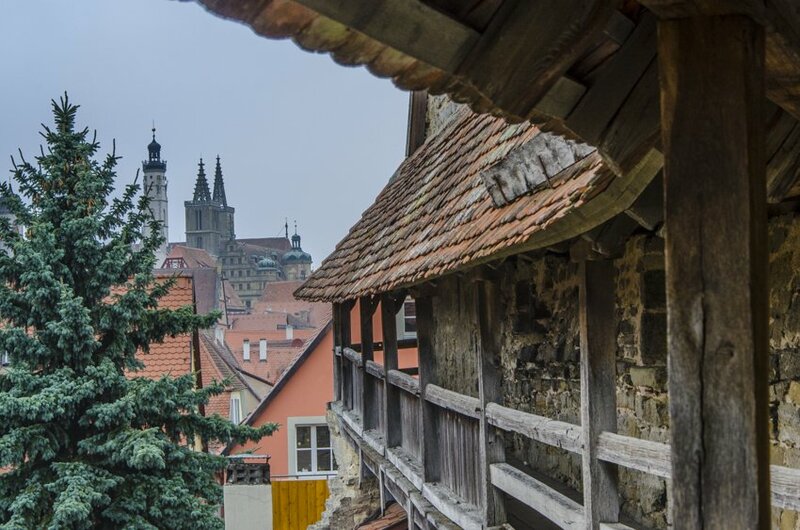 Have you been to Rothenburg ob der Tauber? Would you like to visit this gorgeous little German town? Tell us all about it by leaving a comment. 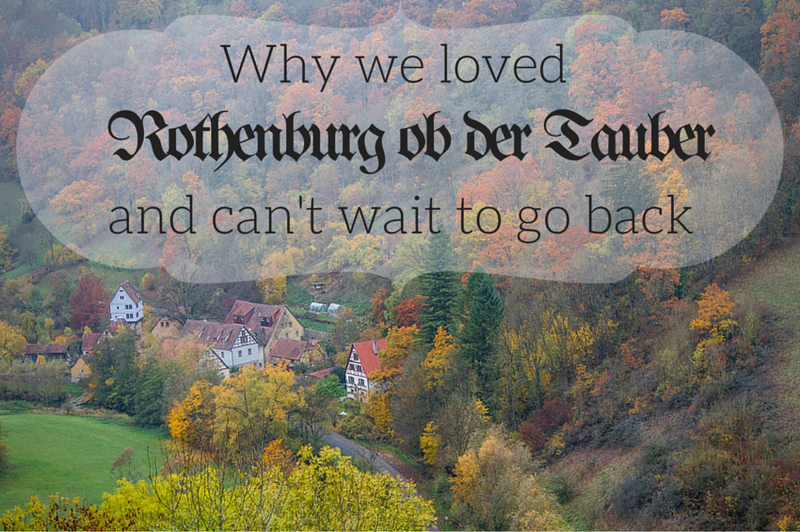 5 Comments on “Why we loved Rothenburg ob der Tauber and can’t wait to go back”. Join the Conversation Here! Thanks Michelle and David, I really enjoyed your account of Rothenberg! It was our first stop out of Frankfurt on our trip so it all looked so quaint and lovely and we were quite mesmerised by the market square and the gorgeous shops. Like you, we found the snowballs looked better than they tasted and we too got the mini ones which were quite enough!! I also read about your tour of Germany – it looks very pretty in the autumn and your pics are stunning. Glad you had a great time. You’re welcome Judy, glad you enjoyed the post. Stay tuned for more to come. I was also hoping to see more autumn leaves and pastries. We also stayed at the Burg on our road trip – in the front of the hotel with the wall statue just outside our window – breakfast on the wall was magical! 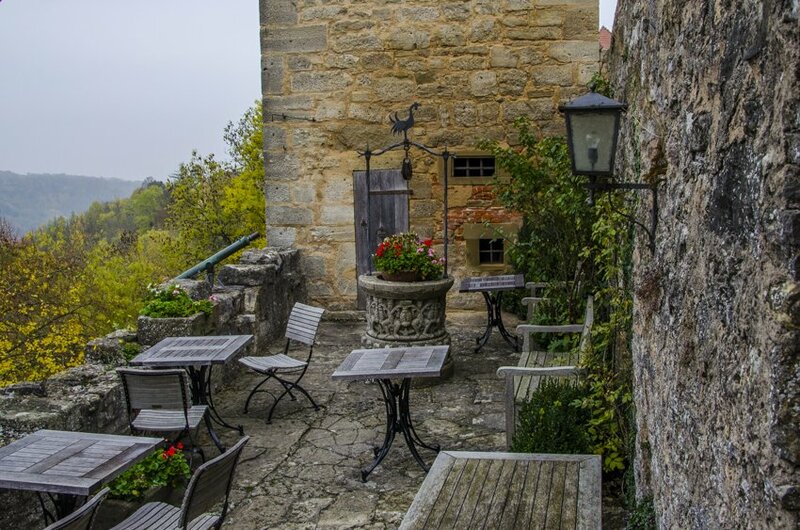 🙂 We did a circular tour, staying in several places including Dijon, Leukabad (Switzerland), Feldkirch (Austria), Fussen, Nordlingen, Dinklesburg, Rothenburg and in a chateau near Waterloo, before returning home to the Peak District. (Please excuse spelling!?) It took over three weeks and was the best holiday we’ve ever had – would recommend to anyone who likes fairytale scenery, good food and friendly places. Wow Lyn that sounds like an amazing road trip! Thanks for sharing with us, certainly some places you mentioned will be added to our bucket list.